National governments are enacting new, stringent data privacy laws to protect citizen data, guard national security interests, and potentially provide a boost to local industries. This rush to protect sensitive and personally identifiable information threatens current business strategies, practices, and processes widely used by organizations that operate internationally. 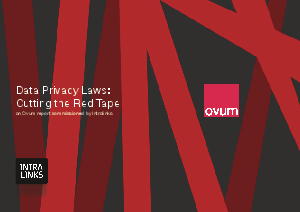 Data privacy regulations are not going away. Organizations need a way to cut through the red tape and develop a compliance strategy which includes people, processes and technology.